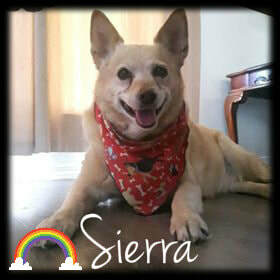 Sierra was adopted in August 2005 and today, her family let us know that she crossed the Rainbow Bridge. They are heartbroken over the loss of their family member. We send our deepest sympathies, it's never easy saying goodbye. We are so thankful she lived such a long and full life with you. "“What we have once enjoyed we can never lose; All that we love deeply becomes a part of us." We received sad news of the passing of two of our alumnis Missy and Pooh Bear, recently at the ages of 18 years old. Their forever Mom wrote a beautiful letter and asked us to share. Missy came to me via Shahna Rice (founder of FFFF) when she was trapped. They found she was very wild and asked me to take her as a result. For the first year, she lived most of the time in the suspended ceiling in the basement. She started to sleep on the end of the bed at night and gradually moved her way up. She found being petted wasn’t so bad and she became my little buddy. She enjoyed life with us but was always leery of other people. She would sit on the deck in the sun and when I would talk to her, she would come up the step with a bounce in her step. Shadow came into FFFF because of allergies in her family. She was placed in various foster homes but came to us as I was looking after some other cats in rescue. We decided to keep her when she was left behind after the others were adopted. Her name became Pooh Bear. She was a very determined girl! She was with us for 12 years. Missy and Pooh always slept with me. Pooh liked my pillow and always made sure to let me know when she wanted it! Missy and Pooh Bear passed over the Rainbow Bridge knowing they were loved. Christine Hearn & Harold Whittingham"
We are so sorry to hear of their passing, but know that they had many years of love and a wonderful life with both of you. Thank you for giving them such a perfect forever home..... We also want to send our sincerest gratitude for your generous donation in their memory. Another of our beautiful alumni has crossed the Rainbow Bridge, Reilly (was Philly) lost his battle with cancer in November 2017 and was laid to rest in the comfort of his own home with his mom by his side. We are saddened to learn that one of our alumni has recently crossed the Rainbow Bridge. Winnie was adopted back in 2007 by a wonderful home, spending her life with humans that cherished her and other furry friends as her family. We are always heartbroken to hear of our alumni's passing, but at the same time, our hearts are happy knowing they had the best life possible and were very much loved. "When a pet crosses the Rainbow Bridge, life starts over fresh and new. But something there is missing. They're waiting there for you." We are saddened to say that Millie crossed the Rainbow Bridge this past weekend. The first day at the Pound we saw that she was quite thin, looking a little worse for wear, but we felt we could turn that all around. Millie then became quite ill, and we rushed her into the vet for care. After multiple tests and procedures, we discovered that before ending up at the Pound, something had happened to permanently damage her kidneys. With tests results in hand, a poor prognosis and a frank discussion with her vet, the heartbreaking decision was made to say goodbye. Thank you to Millie’s foster family for showering her with love. To Millie...what we wouldn’t give to have met you sooner. Run free sweet girl. We are absolutely heartbroken to say that Cheech passed away suddenly early this morning, in the arms of his loving foster momma. We will shed plenty of tears but take comfort knowing he knew love, happiness and security during his last few years with us. We send our deepest sympathy and gratitude to his foster parents, who loved him and cared immensely for him. RIP Cheech...you will be so missed. We learned, with heavy hearts, that alumni Bam Bam (formerly Petey) has crossed the Rainbow Bridge. His forever Mom sent us this message, “So incredibly heart broken to tell you my FFFF pug Bam Bam has passed away. We are so thankful to have had this amazing dog. I can’t imagine my home without him - can’t even think of him without tears. Thank you for my amazing pug Bam Bam.” We are sad to hear of his passing, but our hearts are full knowing he was so well loved. We were saddened to hear that one of our alumnis Flame, has crossed the Rainbow Bridge. She and her siblings, Spark and Smoke, came into rescue after being rescued from a rural dump where they were burning garbage. Her family wrote: "It breaks our hearts to have to tell you that Flame has made her way to doggy heaven. She was such a sweet girl and loved her 2 human sisters more than we will ever be able to put into words. We spent 9 amazing years together as a family and there won’t be a day that goes by that we won’t miss her." "Some angels choose fur instead of wings"
​We just wanted to let you know that our sweet Ovie passed away yesterday (January 15, 2019). We adopted Ovie 7 years ago from Funds for Furry Friends. He brought joy and happiness into our home. We loved him so much. He was a gentle sweet soul who gave us so much joy and love.